We eat potatoes at least 2 times a week, sometimes three, so I’m always on the look out for new things to do with them. Although they probably wouldn’t want to readily admit to it, the sons like a little spice in their lives, or in this case, variety. These are a different take on ‘traditional’ roasted potatoes. We shall call them oven fries. I have kids, which would yours choose? The fancy, shmancy roasted potatoes, or something with the word fries in it? The lemon juice gives them a little tang and they’re roasted to crispy perfection on the outside, leaving the inside nice and tender. 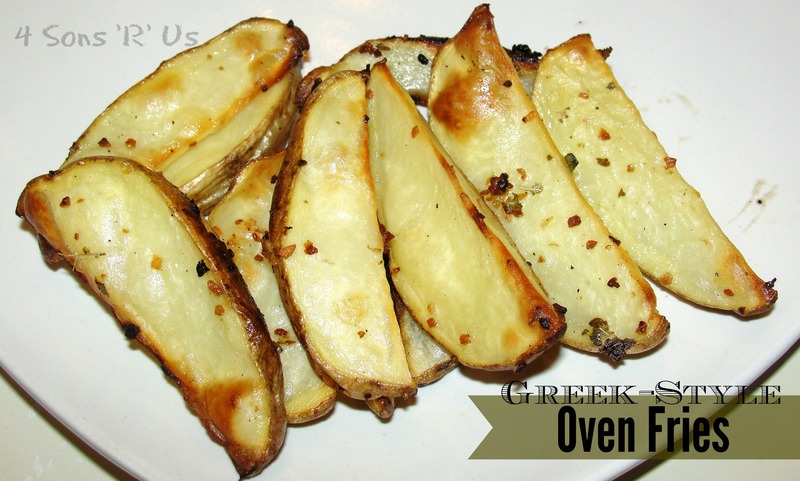 These oven roasted, Greek-style fries are the perfect accompaniment to almost any meal. I highly recommend making sure to double the recipe though, because you won’t have enough!! Yes, they are THAT GOOD!!! 1. Cut each potato lengthwise into 8 wedges. 2. Combine lemon juice, olive oil, oregano, pepper, salt, and garlic in a large bowl. 3. Add potatoes and toss well to coat. 4. Place potatoes, skin side down, on a baking sheet that has been coated with cooking spray. 5. Bake at 400 degrees for 45 minutes or until potatoes are tender and lightly browned. If desired, you can sprinkle some Feta cheese crumbles over potatoes before serving.